"It's critical not only for those who love sports, but the main reason I got into it was because it protected state revenues," Walker said last week, citing the income taxes Wisconsin would lose if the team leaves the state. "That just creates a big hole for everything else. ...This was really about protecting the taxpayers of the state." Walker's office has put out a slew of charts claiming to show that the Bucks arena would be a good deal for taxpayers, charts that have gotten recycled a ton in the print and web media, because charts. For example, who can argue with this? The tower on the left is bigger than the one on the right! And in color! No one could possibly be afraid of a pleasing taupe! So what, exactly, do those "No Arena" loss numbers mean? The top one is the simplest to understand: It's the $120 million that the governor estimates it would cost to maintain the Bucks' current home, the Bradley Center, for another ten years. Those estimates, though, don't exactly match reality. First off, $20 million of that is existing debt on the Bradley Center, which the state would have to pay off regardless. Likewise, the state would have to pay for maintenance and upgrades on a new arena as well if the Bucks stayed—something that's yet to be negotiated, but could be substantial, given that a new building would have more expensive things that could break. And finally, the Wisconsin legislature's own independent legal advisers say the state wouldn't be on the hook for any upkeep if the Bucks left. So trim that green rectangle down to a thin slice. The red and blue are both parts of another Walker-concocted number: The future income taxes to be paid by Bucks players and staff. The bottom slab, $130 million, is what the state would bring in from team income taxes over the next 20 years if NBA payrolls stay the same. The top slab, $169 million, is projected earnings from future increases in player salaries. And as for Walker's future revenue projections, I previously calculated that for his income tax numbers to come true, the average NBA salary would have to reach $33 million by the year 2046. And while that's plausible given current salary trends, it also envisions a future where our children are paying $1000 a month for their cable bill, which means any taxpayer windfall could easily be wiped out by the increasingly-likely downsizing of the Sports Cable Bubble, and/or the Cable Riots of 2045. It's one of the core arguments in the I'm-a-billionaire, so-buy-me-a-stadium playbook, and remains so even as economists continue to find zero evidence that it's worked anywhere ever. The classic study here was conducted way back in 1987 by Lake Forest College professor Robert Baade, who compared several cities with and without teams and found zero evidence that new sports venues do squat for increasing per-capita income in their home cities. Other economists have looked at the same question from different angles—what if we look at income in every major city? What about during strikes and lockouts? What about sales tax receipts?—and similarly found nothing, to the point that there are relatively few new studies on the subject, because most economists consider the question asked and answered. But none of these is quite what we're looking for: a city that lost its team and how it fared afterwards. A recent paper by Brad Humphreys and his West Virginia University colleague Adam Nowak looked at one of the more notorious recent NBA relocations—the Seattle Sonics' flight to Oklahoma City in 2008—and examined yet another marker of economic health: condo sale prices. According to their findings (which involve a lot of math with Greek letters, so tread at your own risk), after the Sonics left Key Arena, nearby property values around Key Arena rose faster than those farther from the now-NBA-free arena, leading the authors to conclude that people don't actually want to live near NBA arenas thanks to the "traffic, crowds, noise, trash, and other activities associated with NBA games." Humphreys, who is currently working on yet another paper looking for any sign of a surge in new restaurants and bars around sports venues (SPOILER: He couldn't find any), says he thinks it's time to conclude that losing a sports team has no economic costs for a city. "I keep trying to tick off all the boxes," he says: per-capita income, employment, economic activities during strikes, none have shown any measurable impact from sports teams' presence. "I don't think there's any support whatsoever to the claim that a city's economy is going to suffer when a team leaves." So what does that mean for Wisconsin and the piles of cash it just foisted upon Edens and Lasry? Simple: if there's really demand for tons of downtown development in Milwaukee, the city could probably take advantage of it and build stuff with or without a new arena—or the team itself. In fact, when economist Geoffrey Propheter studied NBA arenas in particular, he concluded that arena builders are more often seeking out areas ripe for takeoff rather than revitalizing rundown zones—or as he put it, "professional sports are not the cause of development so much as they are the effect." 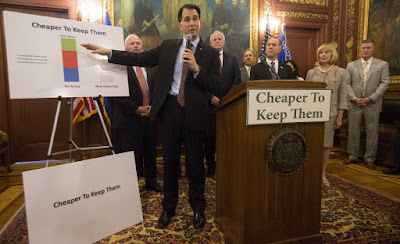 Walker is right on a lot of issues, but on corporate welfare he's dead wrong. What is most troubling is that the research is out there almost universally condemning professional sports subsidies, yet Walker chooses to ignore it in favor of handing over the tax dollars of hard working men and women to billionaire sports team owners. Is there a credible argument for why Walker should be allowed anywhere near the federal treasury given his position on the Milwaukee Bucks bill? I've never been a huge fan of Scott Walker- I just never had that "in my gut feeling" that he was really a "Conservative". I felt he played well to the crowds and the video cameras although he did take some wise economic stands. This is yet another report that vindicates my gut and verifies my sense that I'd probably never vote for him. There is now no doubt in my mind that Scott Walker would never get my vote no matter what office he sought. Just another statist RINO Traitor like Mitch Daniels and Mike Pence. Yeah this is what we need in a president. Mike Pence is also a crony capitalist. He just gave $84 million to the quasi-government IEDC to hand out to the local chambers of commerce!